You know the way you move quickly through your duties as a line worker? Hiring managers do the same thing—only they're looking at resumes. To be the successful job candidate for production line jobs, it helps to have a comprehensive resume that stands out from the crowd. 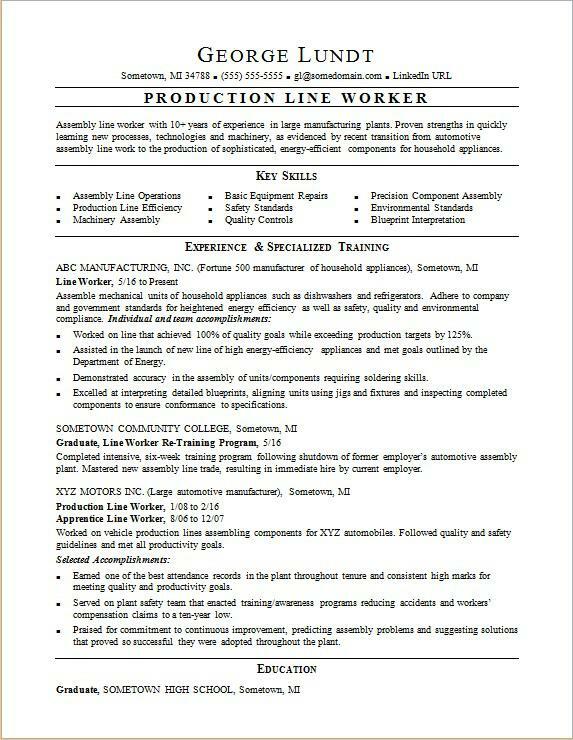 For guidance, view the sample resume for a production line worker below and download the production line worker resume template in Word. According to the Bureau of Labor Statistics (BLS), you'll find the highest level of employment for engine and other machine assemblers in the following states: Ohio, Michigan, Indiana, Illinois, and Texas; and in the following metropolitan areas: Warren, MI; Cleveland; Cincinnati; Dayton, OH; and Chicago. As a line worker, you can expect to earn a median wage of $31,850 per year, or $15.31 per hour, according to the BLS. Additionally, you can learn more about production and operation careers and manufacturing careers on Monster. Assembly line worker with 10+ years of experience in large manufacturing plants. Proven strengths in quickly learning new processes, technologies and machinery, as evidenced by recent transition from automotive assembly line work to the production of sophisticated, energy-efficient components for household appliances. Worked on line that achieved 100% of quality goals while exceeding production targets by 125%. Assisted in the launch of new line of high energy-efficiency appliances and met goals outlined by the Department of Energy. Demonstrated accuracy in the assembly of units/components requiring soldering skills. Excelled at interpreting detailed blueprints, aligning units using jigs and fixtures and inspecting completed components to ensure conformance to specifications. Completed intensive, six-week training program following shutdown of former employer’s automotive assembly plant. Mastered new assembly line trade, resulting in immediate hire by current employer. Worked on vehicle production lines assembling components for XYZ automobiles. Followed quality and safety guidelines and met all productivity goals. Earned one of the best attendance records in the plant throughout tenure and consistent high marks for meeting quality and productivity goals. Served on plant safety team that enacted training/awareness programs reducing accidents and workers’ compensation claims to a ten-year low. Praised for commitment to continuous improvement, predicting assembly problems and suggesting solutions that proved so successful they were adopted throughout the plant. Before you submit your resume to some job ads, you want to make sure it's presenting you in the strongest light. Could you use some help refining your resume? Get a free resume evaluation today from the experts at Monster's Resume Writing Service. You'll get detailed feedback in two business days, including a review of your resume's appearance and content, and a prediction of a recruiter's first impression. Think of it as quality assurance for your career. You are now a Monster member—and you'll receive more content in your inbox soon. Your perfect match is out there!